Isla de la Plata (island of silver) is the most famous of the islands in Machalilla National Park. Renowned for its abundant and exotic wildlife, exquisite unspoiled beaches and rich historical past, Isla de la Plata offers fantastic opportunities for curious travelers. 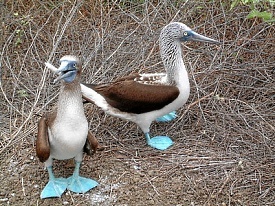 Search for the island's great number of resident and migratory birds, including blue-footed and masked boobies, frigate birds, pelicans, and giant albatross. Swim and snorkel in crystal-clear waters, perhaps coming face-to-face with a friendly sea lion. Visit a local museum or archaeological site to observe artifacts from ancient indigenous peoples. Watch for migrating whales as they make their way through the waters surrounding the island.